Air U.S. (BH) was a Denver, Colorado based commuter carrier that started operations on April 1, 1977. The carrier was initially established to provide flights between Riverton, Wyoming and Denver, Colorado. A few months later, passenger services were started to both Gillette and Sheridan, Wyoming, both areas having coal energy resources and growing employment. The name Air U.S. was the commuter division of US Aviation, the parent company, which also provided air-taxi and charter services. Commuter flights started on April 4, 1977 using a Piper Navajo Chieftain on the Riverton-Denver route. In 1978, the company purchased Valley Airpark based in Fort Collins, Colorado and had been providing commuter services to Denver with Piper Senecas. 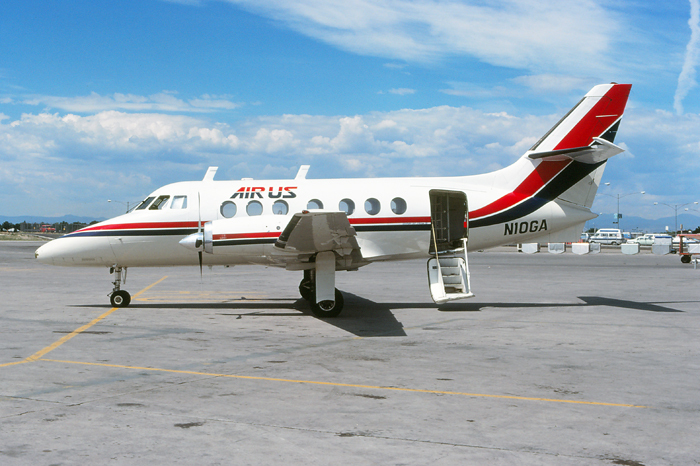 Seeing the demand of the routes into Wyoming and the need for more efficient equipment, Air U.S. purchased a Handley Page Jetstream turboprop in September 1978. Another Jetstream was leased in 1980, to provide increased service to Sheridan after Western Airlines discontinued serving the city from Denver in the summer of 1980. Hoping to expand and provide “airline” level service to its passengers, Air U.S. took the bold step in ordering six Grumman Gulfstream G-159 Turboprops. The new “heavy” turboprop, had seating for 34-passengers, Rolls Royce engines and a cruising speed of 300 miles-per-hour. With the first plane delivered in May 1981, passenger services to both Sheridan and Gillette were started on June 1, 1981 using the new planes. Two new cities were added in 1981; Riverton, Wyoming and Gunnison, Colorado using the Jetstreams. As the majors were consolidating more profitable routes and cutting smaller cities, Air U.S. quickly started service to both Worland and Cody, Wyoming after Frontier Airlines dropped services there in 1982. 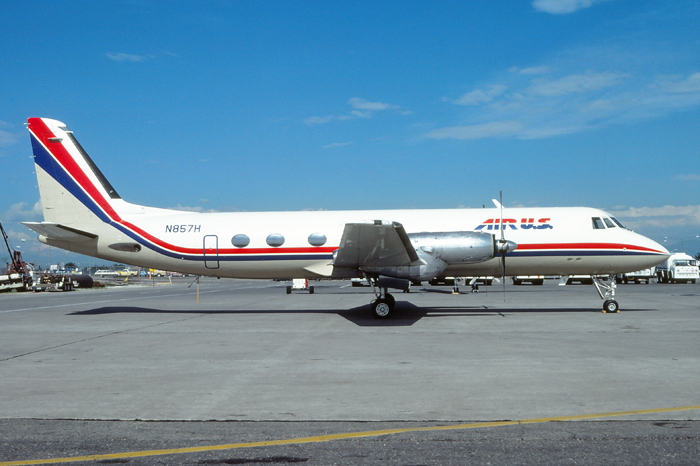 Air U.S. continued to grow into 1983, added a second Gulfstream turboprop, added two more cities in Wyoming; both Laramie and Rocksprings, and establishing an interline agreement with United Airlines in Denver. Although the future looked bright and the addition of a third Gulfstream was set to expand services, the airline started to suffer financially and was forced to file bankruptcy stopping all passenger services by the fall of 1985, and the aircraft were repossessed in December 1985. Air U.S. first turboprop aircraft was the British built Handley-Page Jetstream. Parked on the ramp at Denver Stapleton Airport in July 1979, is N10GA, a Handley Page HP.137 Mk. 1 Jetstream, purchased by the airline in September 1978. 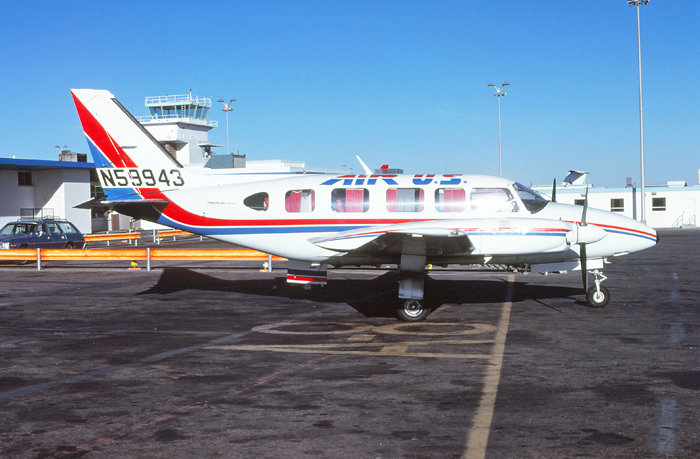 Air U.S. started scheduled passenger operations using a Piper Navajo aircraft. Parked at the commuter ramp at Denver Stapleton Airport in October 1979, and wearing a patriotic color scheme is N59943, a Piper PA-31-350 Navajo Cheiftain. The large turboprop Grumman Gulfstream helped Air U.S. join the ranks of a true "airline" with comfort, speed, and safety over the rugged Rocky Mountains. Parked on the ramp at Denver Stapleton Airport in July 1982, is N857H, a Grumman Gulfstream G-159, originally delivered to American Aviation Corporation in 1962, then serving as the corporate aircraft for H.J. Heinz corporation in 1970, and subsequently purchased by Air U.S. in June 1981.